It's the first Monday in May, meaning the fashion world is celebrating the Metropolitan Museum of Art's newest Costume Institute exhibit with the annual Met Gala! This year's theme is "Heavenly Bodies: Fashion and the Catholic Imagination". Examining the ways in which designers have been influenced by religious aesthetics, the red carpet lived up to it's billing as the most incredible fashion event of the year. Celebrities worked with designers to really dive into this subject, and the result was superb in the various nuanced and gorgeous looks. Here are a few standout ladies and gentleman who took the theme and proved that fashion and religion can be a match made in heaven! Bake Lively's beaded Versace gown took over 600 hours to create and it showed. With it's unexpected sheer leggings, jewel tones, and impeccably fitted corset, she looked every inch of renaissance royalty. Dior's gothic glam dress from the Spring/Summer 2018 collection was a great choice for Cara Delevigne. Open birdcage paneling on top of a sheer bodysuit suggests a confessional situation. The curtain-like drops from her crown headpiece add to the mysterious feel of the look. Once again, Rihanna proves she is the red carpet couture queen in this intricately embellished Maison Martin Margiela look. She makes the edgy and ornate layering of a mini dress, over skirt and off the shoulder jacket look effortless, all while balancing the perfect finishing touch: her glittering mitre. Donald Glover wore a custom Gucci one-button tuxedo in mauve with grosgrain details and a ruffle pleated evening shirt. Still riding the wave of his powerful new song and video for "This Is America", he is no stranger to both in-your-face and subtle messaging when it comes to aesthetics. The back of his jacket featured the Eye of Providence in gold embroidery, a clever nod to the symbolism of divine presence that also happens to appear on the back of money, and which some associate with looking similar to the illuminati icon. Jared Leto is a longtime muse of Gucci designer Allesandro Michele, and is often in head to toe ensembles from the house. Naturally, they took this opportunity to capitalize on his already Jesus-like looks! Adding a gold leaf crown and embroidered sash to his pale blue wide-lapeled suit, they mixed retro, modern and byzantine vibes to a cool effect. Chadwick Boseman has been showing the men how it's done on the red carpet all year, and the Met Gala was no different. 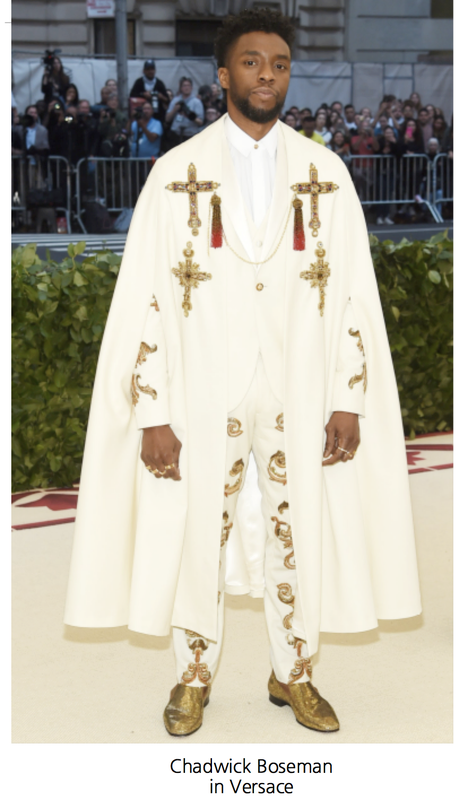 He pulled no punches in ivory Versace, complete with a cape inspired by religious robes, cross details, and a tasseled chest chain. The time, research and collaboration of these celebrities and their designers resulted in some truly memorable looks. Drawing on iconic imagery and pushing creativity to it's limits really paid off on this red carpet. That's the kind of haute holiness that happens when stars fully embrace and embody the Met Gala theme!